Efforts to get my kitchen completely organized are starting to payoff. I just love to open these drawers and see everything looking so beautiful and orderly. I have finally created a low budget but high quality drawer system. 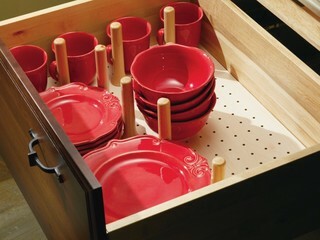 Today, I am providing the details for this dish drawer organizer. After finishing with the utensil drawer organizer, I decided to move on to the dish drawer. Yet, another project that would have cost an additional couple of hundred dollars to have it customized at the manufacturers. However, I have saved 75% off the manufacturer’s cost. In addition, I priced out one of those quick do-it-yourself kits.Like this one from Rev-a-Shelf. For my drawer, I could get an insert with 16 pegs for around $110. Then, I would still need to buy several more pegs to get the layout that I want. Plus, I would have had to cut the insert to fit once it arrived. So, why spend that much money if I have to start cutting and adjusting? I figured, I might as well do the entire thing myself, get a better quality product, and save some money to boot. So in a few moments, I am sure many of you will be asking, “but why not just use the pegboard?” Good question. I did come across one other website recommending the use of a pegboard, but if you are familiar with them, then you know how easy it is for the holes to become distorted and/or torn. I wanted this organizer to be permanent and sturdy. Kitchen Drawer Organizers by Jasper Cabinets & Cabinetry MasterBrand Cabinets, Inc. If you ever look at a custom drawer from a high end manufacturer (like this one from MasterBrand Cabinets), you will notice that these inserts are made from cabinet grade wood panels, they are at least 1/2″ thick, and they are significantly more stable than a pegboard from your local hardware store. Pegboard on the other hand, are made from perforated hardboard that is 1/4″ thick. If you look closely, you will notice that they almost look like compressed paper. Though they are good for many things, I certainly didn’t want to have results that I have seen on my own garage storage. It just doesn’t take much wear and tear to damage these holes. But, at least in the garage I can just move a tool to a different hole. However, I wanted to avoid that situation here. 1/2″ cabinet grade plywood cut to drawer dimensions. Step 1 – Begin by placing the panel face up on your work table or space. Because drills tend to splinter as they exit, having the bad side facing down with keep the good side looking nice. If both sides are equal, then don’t worry about it. (For those of you interested, I used birch plywood. However, most of the big box stores carry Oak in 1/2″ as well. Step 2 – Attach the pegboard template to the plywood panel using the clamps. Make sure that it is held in place tightly. You don’t want it slipping when you begin to drill. Step 3 – Using a 3/16 size drill bit, begin to drill holes through each peg hole. This is probably the most tedious part of the project. It may seem like it is taking a long time, but that is just because it is repetitious. Step 4 – Once you have finished drilling all of the holes, remove the pegboard and flip the plywood panel over. You will probably have a lot of jagged little edges like I have here. This is where yo will need the sander/sandpaper. If you have an orbital sander, this will take just a few seconds. Just knock all of these rough edges off to make the bottom smooth. Step 5 – Apply a light coat of polyacrylic to the top side of the panel board. Allow it dry thoroughly. Then, lightly sand the finsh to remove any rough areas. Wipe down the panel to remove any stray dust. (I like to use a tack cloth for this). Re apply a second coat of polyacrylic and let dry. Step 6 – To prepare the dowels, I used my miter box to secure them. It is very important to have these secure before attempting to drill into the ends. This is just the method that I used. Use whatever you feel is safe. Step – 7 Attaching a piece of tape to the bit can help as a guide for the proper depth. Attach the tape so that the bit and the wood screw end of the hanging bolt are the same depth. Step – 8 Next, drill a hole into the center of one end on the dowels, using a 9/64 drill bit. Then, screw the hanging bolt into the the hole. (wood screw threads go into the dowel with the machine threads protruding). Step 9 – You will be inserting the T-nuts in the bottom side of the panel so that you can screw the dowels in place later. You will want to decide on a layout before inserting the T-Nuts. The best way to do this is to turn the panel over so that the back is facing up. Place your dishware where you want it, and insert the T-Nuts accordingly. You may need to tap them in place with a hammer. Remember that you are looking at the backside, so everything will be flipped. (i.e. The dishes that belong in the back of the drawer will be sitting on the front). Once you flip the panel back to the front side, everything should be in the location that you want. Step 10 – Insert the panel in the drawer face up and screw the dowels into the holes where you placed the T-Nuts. Then add your dishes! Because I know that some of you are just now saying, “but won’t this be difficult to change the dishes around?” Well, it won’t be as easy as the kits that allow you to just unscrew the dowels and screw into a different hole. I did it this way, because I wanted the the steel of the T-nuts to be supportive of any pressure made on the dowels, instead of the wood taking the pressure. This way the organizer will last a good long time. I am okay with removing the panel and adding more T-nuts if/when I want to make adjustments to my layout. (I don’t usually move things once they are organized anyway, but just in case, I have a few extra dowels and T-nuts on hand). But, for those of you who prefer a bit more ease over structure, I would recommend this. Instead of using hanging bolts, use dowel pins (AKA double sided screws). This will eliminate the need for the T-nuts, and it will allow you to move the dowels around easily. However, keep in mind that unscrewing and re screwing the dowels with this method will, over time, wear out the holes, even in the wood panel. Also, if you plan to use this method, you will need to use the 9/64 drill bit for both the holes in the panel and the holes in the dowels. So here is how everything breaks down. Polycrylic and other supplies – already had on hand. That’s a total of $58! Less than half of purchasing a kit. Plus, I feel confident that this one is high quality and will last. You can probably cut costs even more if you have a smaller drawer (mine is 36″ wide), and if you cut the dowels shorter. Good luck, and I hope that you enjoy your organizer! Be sure to check back with me at a later date to see my knife drawer tutorial. Did you need to reinforce the drawer to take the weight of the dishes? It turned out lovely! No, I did not need to reinforce my drawers in any way. But I suppose the plywood could be seen as a type of reinforcement. It doesn’t bend the way a pegboard would, and it distributes the weight across the the surface.